Part of the reason is that the ongoing Gaza crisis has lately been creating havoc in Israel’s domestic politics. Netanyahu’s coalition government has been hanging by a thread ever since his key ally and foreign minister Avigdor Lieberman withdrew his party from it just before Operation Protective Edge began. Right on: Avigdor Lieberman and Benjamin Netanyahu. Lieberman’s right-wing, secularist Yisrael Beitanu party won 11 seats in the 2013 election, running on a joint list with Netanyahu’s Likud party. 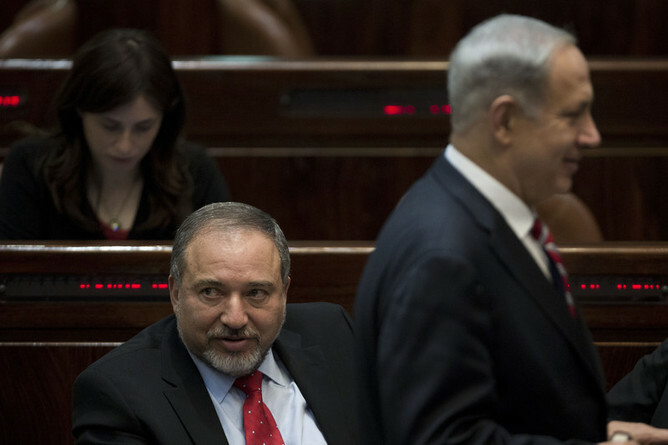 Its exit from the coalition reflected what Lieberman called “substantial and fundamental differences” between himself and Netanyahu over what should be done about Hamas rocket attacks on Israel.